Make their birthday celebration last all month long with our cheerful keepsake gift. 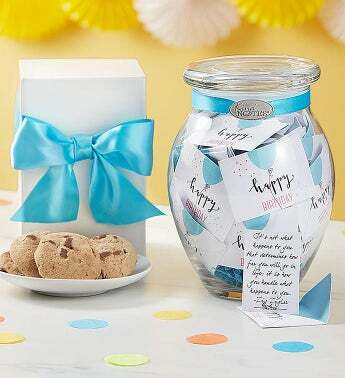 Inside a charming glass jar finished with a lovely turquoise ribbon, they’ll discover 31 festive mini envelopes, each containing a special Kind Note of friendship. Make their big day truly unforgettable by adding delicious chocolate chip cookies from Cheryl’s, one of our gourmet food brands! For over 30 years, Cheryl’s has offered gourmet cookies, brownies, and other delicious baked goods—perfect for all of life’s celebrations.